Observations At Six Months – Sunshine. Whimsy. Tacos. In German, Kerze means candle. Katze means cat. Mishearing one or the other can lead to a very silly conversation. 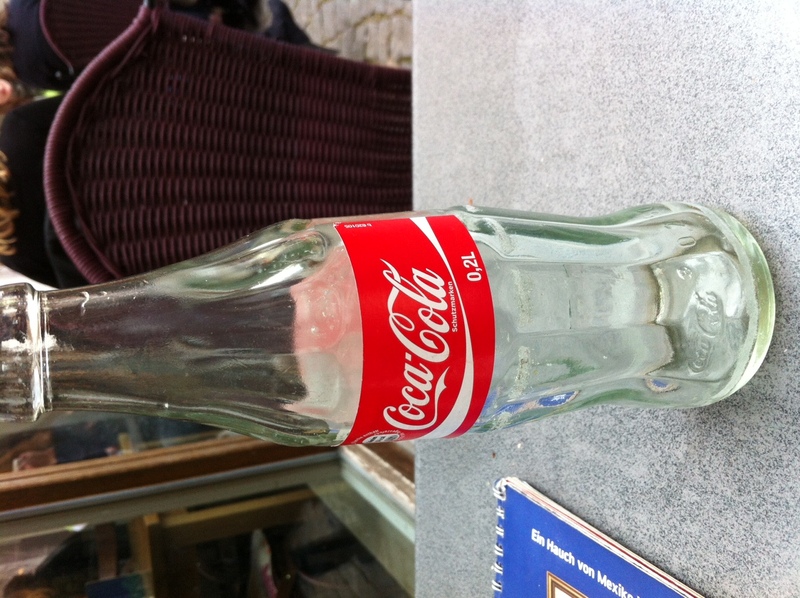 They sell the perfect size Coke here. .2 Liters is enough to accompany most meals without being as small as a shot glass. Movie theatre popcorn here is not salty by default, it’s sweet. Not all theatres even sell the salty version that I’m used to. I was very surprised the first time I took a bite of movie theatre popcorn here. Many Germans are very, very tall. I’m still convinced that someone boinked a Frost Giant at some point in the past. There is one German word, Entschuldigen, which can be used for both excuse and apology. This is yet another way that conversations between native English speakers and those for whom German is a second language can be very complicated. The German approach to child-rearing is a little bit different. The American “stranger-danger” paranoia doesn’t exist here, so it’s not uncommon to see a list of children’s names on the back of a proud parent’s vehicle. 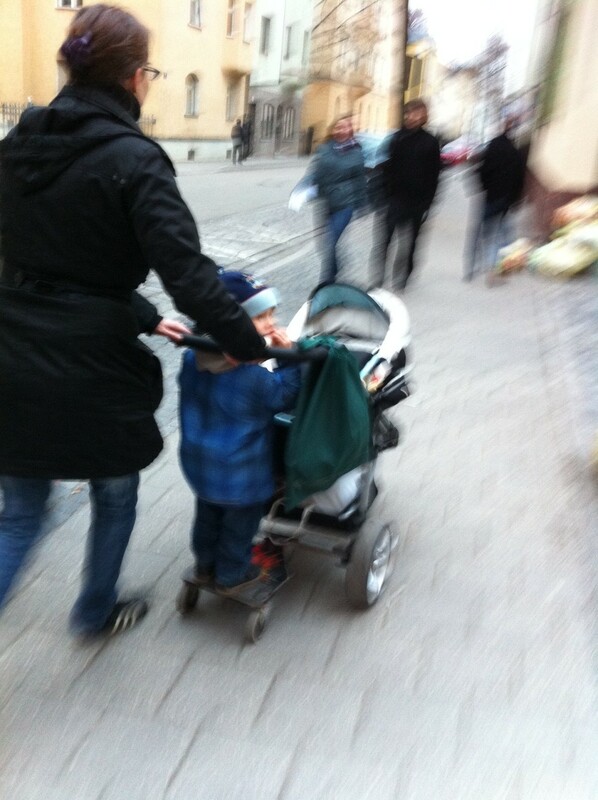 They also rig up these ingenious skateboardy things that are attached to the back of their strollers with a little hinge like the one pictured at right- this woman is pushing the stroller with the infant, and the smaller kid stands on the little board with the wheels, so he gets a ride as well. I think it kind of looks like fun. Where an American would say “I’m crossing my fingers for you,” a German would say “I’m pressing my thumbs.” It means basically the same thing- wishing luck or good fortune. It is done with the thumb of one hand only, bending it inside the index finger and pressing on the outer joint of the thumb with the fingers curled around it. It’s a small difference, but I’ve noticed that public restrooms here are not constructed the same way that they are in the US. 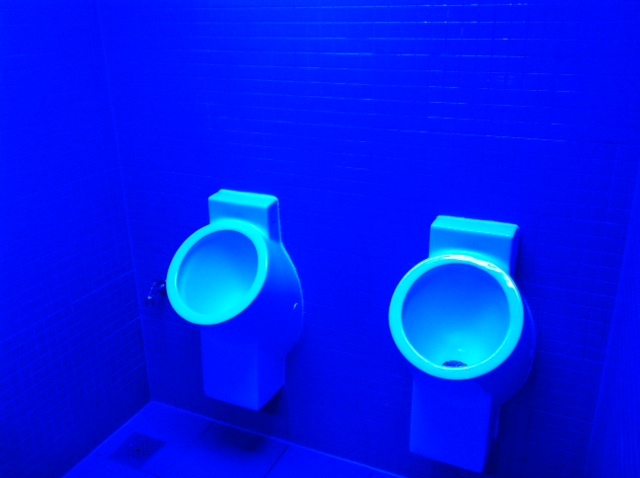 The area where toilets and urinals stand is usually separated by the area with the sink and hand dryers by a door, so each restroom is actually two smaller connected rooms. This is not the case in private bathrooms or very small restaurants, but most of the restrooms that I’ve been in here outside of my own apartment are built this way. Germany uses the letter ß. The letter is pronounced as ‘ss’ and that is an acceptable alternate spelling. This is especially common on street signs. For example, one of the main streets downtown is Maximilianstraße. This can also be typed as Maximilianstrasse, or abbreviated as Maximilianstr. The reason I bring up the letter ß is that it comes up several times in the next bullet point. Elevator buttons are different here. The ground floor is usually labelled EG, which means Erdgeschoß, the German word for the ground floor. I first thought it had something to do with ‘Entrance.’ A parking level below the first level is often labelled with UG. I thought at first that it meant ‘Underground,’ but it really means Untergeschoß. An upper level would be OG for Obergeschoß. A parking garage is usually called a tiefgarage, but don’t expect to see that listed on the elevator buttons. Sometimes, the ground floor is labelled with 0 and a level below that is marked as -1. The first level above the ground floor is labelled 1 because Germans consider the first level up to be the first floor. In other words, I climb a flight of stairs every day to go to my first floor apartment, but in the US I’d call it a second story apartment. Speaking of things being different underground, the duplex parking here can be a little nerve-wracking. 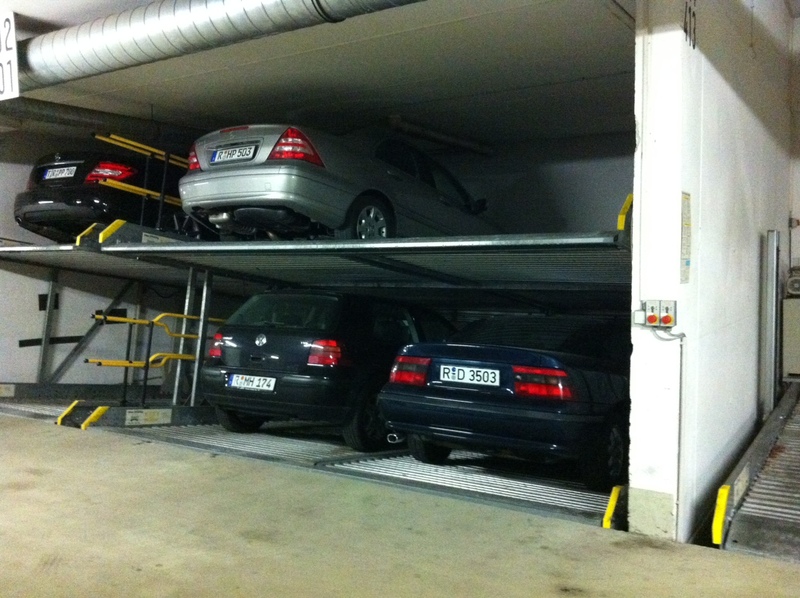 This may exist in the US, but I’d never seen it until I got here- underground parking where a space can have multiple stacked vehicles. Each person who uses a parking space has a key to raise and lower the parking ramp. I would be constantly worried that I would drop my keys down into the Pit Of Souls beneath the lowest cars. Still, it’s an impressive use of space. And hydraulics. Congratulations on hitting the half-year mark! A note or two, if I may, on the language points you mentioned. Maybe they’ll help you or some future surfer. Regarding the sharp-s: the spelling reforms over the years seem to approve “ß” when the preceding vowel sound is long — as in “groß” and not short, as in “kross” or “krass“. I think that even applies to the convention of “-sst”: It’s “zusammengefasst” and “isst” (now) and not “zusammengefaßt” or “ißt” (anymore), though I’m pretty sure those forms used to be preferred. It’s not a hard and fast rule, or maybe it depends on pronunication distinctions that are so fine as to be practically imperceptible (for natives, let alone foreign speakers). Consider “Straße” and “Wasser.” I try not to worry too much about it, given that the Swiss (“the Swiß?”) don’t bother with “ß” at all, and those spelling reformers have made plenty of native speakers look like Klowns. You can’t randomly exchange ß and ss. It’s OK when you have to like for a web address or to fill in forms in capital letters. But otherwise it’s wrong. Also, in the East of Germany, people don’t call it “scharfes s” but “S Z” and they replace it not by ss but by – obviously, duh! – sz. I stand corrected. I just know that computer stuff doesn’t generally like the ß in a typed address, so I leapt to an incorrect assumption. Congratulations on your half year anniversary! Buggy boards are now pervading all of Europe if not the world. They are perfect for nice tall Germans but if you are a 5’4″ Scot you kind of have to walk with a constant bend so you don’t catch your ankles. Grr.. I LOVE those stacked garages! I would love to have a space in one for our car even though they slightly terrify me. Anyway, here’s to your next 6 months and beyond! Enjoy! 1) I want someone to push me around on one of those stroller boards all day. 2) My friend was trying to explain the thumb pressing thing to me the other week and it took a good 5 minutes for me to figure out what the hell she was going on about. I agree that things tend to turn up everywhere like that, but I am 99% sure that prior to that conversation people did not continually walk past me saying “mahlzeit.” Servus/severus I’ve heard, but mahlzeit not. Conspiracy!